You may not believe this, but I actually spend LESS per month in Hawaii than I did when I lived in Chicago! And, that includes all my entertainment, eating out, and grocery shopping. How is this possible? Well, I knew when I moved to Hawaii that I would have to be smarter about my spending. When milk is $6 per gallon, you have to use your head — and the resources at hand. Read on for our top 5 ways to eat,play, and shop in Hawaii on the cheap. I did it, and so can you! 1. Become a Groupon-Addict: You may be under the false belief that companies that advertise on Groupon are struggling or need customers, but that’s not true. 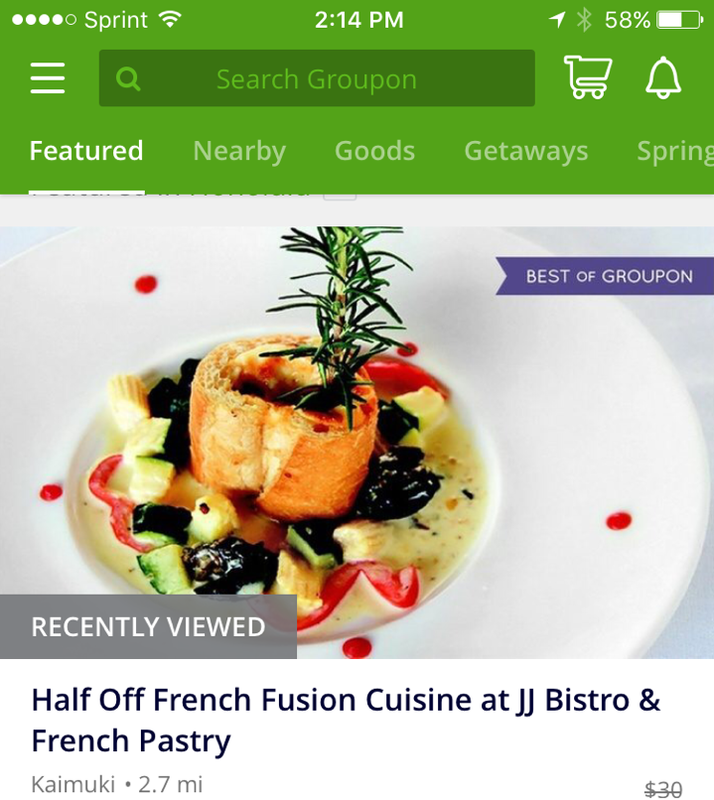 When you land, go to your Groupon app (you should already have this downloaded on your phone), and see what kind of restaurants, venues, and services you find. One of my favorite restaurants, JJ’s Bistro and French Pastry in Kaimuki, has a deal — $30 worth of food for $15 — and I buy one nearly every month. DO NOT pay full-price for anything until you check-out the Groupon app and see what’s available. This includes services, such as entrance fees into venues and fun things like massages. Before I go anywhere, I check to see if there's a Groupon available for that restaurant or venue. If so, I can purchase the Groupon same-day, and use it when I arrive. 2. Go Back in Time: Remember when the world revolved around the Sunday paper? Well, those days are long gone, but you may be surprised at how many useful coupons you’ll find there. If you’re here on a Sunday, spring for an edition of the Honolulu Star Bulletin, and look inside for the goodies. Among other things, I’ve found Subway buy-one-get-one-free deals (perfect for taking sandwiches to the beach), Jack in the Box coupons, and even 15% off Outback Steakhouse. The price of the newspaper is worth all the coupons you’ll find, especially if you’re be staying with us for a while. You’ll also find inserts for Longs and Walgreens drug stores. 3. Which Brings Me to This: Let’s say you DON’T take my advice and buy a Honolulu Star Bulletin on the first Sunday you arrive. Well, you’re in luck if you need something at the drug store. At Longs (CVS) and Walgreens, you’ll find their Sunday newspaper ads on display when you walk in the door. Before you walk right by it, take a look. You’ll often see items you need anyway advertised for far less than usual. For example, you may see the CVS ibuprofin brand on sale for $4.99 right next to the name brand, which sells for $8.99. If you take the time to look at the insert when you shop in Hawaii, you could save $4 right there. 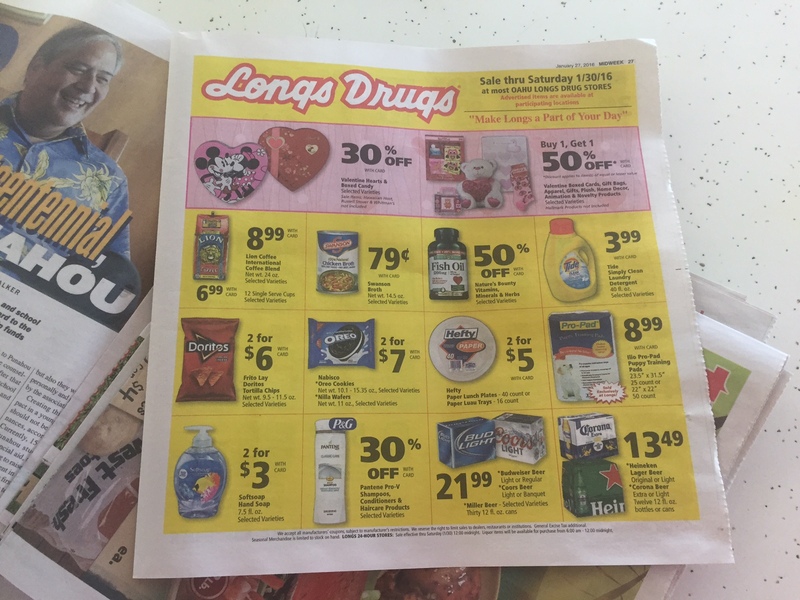 If you take the time to check-out the Longs or Walgreens ads in the Sunday paper, you'll find you can save a bundle on necessary travel items. 4. Become a Card-Carrying Shopper: When you grocery shop at home, how much do you save when you use your Frequent Shopper card? I bet it’s a lot. So, why not become a Frequent Shopper in Hawaii? You don’t have to live here in order to join the “club.” So, when you shop at one of our local grocery stores, make sure you sign up for a card, and you could save upwards of 20% of many items in the store. In fact, I focus much of my grocery shopping around which items are cheaper by using my card, and I spend just about the same on groceries as I spent in Chicago. True. 5. Let Someone Else Save You Money: Some visitors are a little wary of contacting a travel agency or tour company, afraid they’ll be “roped-into” signing up for something they don’t want or need. But, you’d be surprised how much money you can save by letting the someone else company negotiate the discount for you. For example, at Hawaii Aloha Travel, you can save a bundle on Hawaii activities, such as ziplining, luaus, and whale watching tours just by booking the activity through the company. Many venues reserve a certain number of spaces just for those who book through reputable tour companies. And, in return, they give customers a deep discount, that’s passed on to you. A Hawaii vacation CAN be expensive, but it can also be as inexpensive as you want it to be. By following these tips, you’ll be sure to save money on food, entertainment, and shopping, without putting in too much work. After all, who wants to return home from suffering from vacation-debt overload?